The Elantra is available in both petrol and diesel engine options. Hyundai is using a new 2.0-litre petrol engine which punches out 151 HP & 192 Nm. This engine comes mated with both manual and automatic transmissions. We got a chance to drive the petrol automatic variant at the media test drive. This new motor feels quite peppy and has a strong mid & top end. The 6-speed automatic gearbox mated to the petrol engine is the second generation autobox and is more refined now. However, being a single clutch transmission, there is some amount of lag, you feel it more once you completely floor the pedal to the metal. This engine delivers an ARAI certified fuel economy of 14.59 km/l and 14.62 km/l with both the manual and auto gearboxes respectively. Then the firmer suspension steps in to make sure that body control is kept in check on an undulating surface. Considering how bad the old car was, you’ll be impressed to find that this one hardly bounces or floats at all at high speeds. It stays flat and tied down, and back seat passengers will be especially thankful for this. It really feels a whole lot more grown up and, dare we say it, European. As mentioned earlier, it’s only when you hit a bump or speed breaker really hard that you’ll catch the suspension off-guard. This added firmness, however, has not completely eliminated body roll, and you’ll still feel a bit of it when you corner the Elantra hard. What you won’t feel much of when you corner hard is what the front wheels are up to, as the steering is still far too numb. Again, there is a marginal improvement from the previous car, but that seems more to do with added weight than outright feel. You will get a better sense of security at high speeds, or when you accidentally drop one of the front wheels into a pothole – the steering doesn’t go limp in your hands, nor do you feel any steering shock. 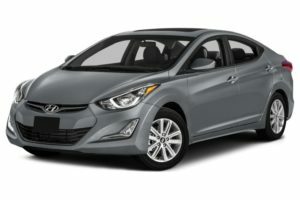 All things considered, you still won’t want to drive the Elantra hard, but you will be thankful for the lightness of the steering when you’re parking or making a three-point turn.